By cfssufferer in Living With Chronic Fatigue Syndrome. In 2015 I detailed the best sleep aids for ME according to ME/CFS specialists and my own experiences. Since this date I have been on a rollercoaster journey in search of some much needed refreshing sleep. This article will cover my travails as well as what I have since learnt regarding sleep studies, Restless Legs Syndrome, Upper Airways Resistance Syndrome, good sleep hygiene and sleep supplements. Dr. Klimas, Dr. Bateman and Dr. Levine all recommend that sleep disturbed ME/CFS patients get a sleep study performed. Sleep studies fall into two categories; firstly those performed in a specialist sleep laboratory, most often in a hospital room and secondly at home sleep studies. 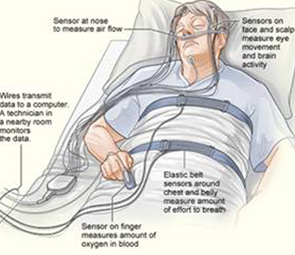 Sleep laboratory studies involve an array of sensors being placed all over the body and a glut of gadgets. They occur overnight- most commonly in a hospital bed and can potentially identify a range of sleep disorders from: sleep apnoea, upper airways resistance syndrome, restless legs syndrome, insomnia, sleepwalking, REM disorders to other sleep issues. Your heart rate, oxygen levels (determined through a sensor, not a needle), eye movements, breathing rates, leg and arm movements and snoring are all monitored as well as the different stages and lengths of your sleep cycle. A narcolepsy test commonly requires that patients complete the in-laboratory sleep study and then subsequently stay for the next day testing process.